Samurai Bloodshow attempts to meld strategy, tower defense and card-based gaming, bludgeoning the genres together using a heavy 12th century feudal Japan art style and some fairly nondescript twangy-ish music. It sort of works. The game bears many similarities to Plants vs. Zombies. You defend from attackers who approach from the right of the screen, traipsing towards you across one of five different horizontal paths. You place warrior cards on these paths such that your army will be positioned in the way of the enemy. If any foes make it to the very left of the playing field, you’re ‘defeated’ and will have to play the level again. The most unique aspect of the game is the previously mentioned card-based gameplay which, to be honest, seemed fairly bland to me. 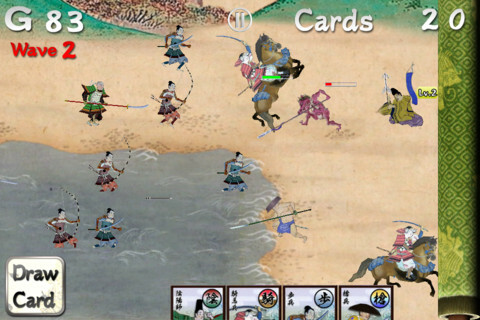 You have a limited number of cards that you can place per stage, and a limited number of different types of cards (with different types of warrior on them – a horse-mounted, sword wielding maniac; an archer, and so on). Before each stage begins, you select how many of each type of card you wish to be able to access during the stage, up to a certain number of total cards. You can’t access every card at the same time, however. Five cards are displayed at any one time, and once you’ve put a card down, you need to spend gold to top up the deck again. Gold accumulates as the level progresses, so you’re never able to place, for example, twenty warriors at once. As well as placing warriors, you can also level them up through placing their warrior card on the square where they’re anchored. Levelling up a unit restores their health and makes them somewhat tougher. It sounds confusing, but is easy to get the hang of. The system is deep enough to allow engaging levels of strategy. However, some early stages can be quite slow, so even if the strategy is engaging, you might have to wait a while before any enemies actually reach the playing field. This problem can be assuaged through a ‘fast forward’ button, although this can also cause enemies to blitz their way through your army without you realising it. I had this problem several times over the three or so hours that I was playing the game for, and it often meant that I had to replay levels after reaching the final wave of enemies. It may be a fault of my impatience, but I don’t enjoy waiting for games to pick up the pace of the action, or, indeed, mistakenly dying after playing a level for ten minutes. The game comes with a few other frustrations, too. When placing units, you have to first click on a grid square, and then click on a tick to confirm that you do indeed wish to place that unit on that grid square. During all of this, enemies are still approaching. If you’re too slow in placing your units, these enemies might well creep past you. This is especially true if you’re placing a warrior on a grid square that’s on the edge of the screen – sometimes, the tick is hidden until you scroll towards it. You essentially need to go through three stages of screen pressing before you can place a unit. Sadly, I also don’t like the picture scroll art style. For me, it feels like it’s trying too hard to seem authentic – the Japanese writing alongside the English; the scroll on the edge of the level screen that unravels as you move from right to left along the playing field – and it begins to detract from the game. Garish yellows and tacky cartoon writing should only really be used to feel intentionally cheap. Otherwise, well… they feel unfortunate. The same goes for a few gameplay devices – on some levels, ‘clouds’ block some of your view of the field of play. It’s a nice idea, but when you can’t see which units you’ve placed where, or how much health they have remaining, it becomes frustrating rather than fun trying to plan your next move. On the plus side, the game is loaded with content. Each of the 20 stages is split into five levels, which increase in difficulty. There’s even online and local multiplayer, but I’ve not been able to try either mode so I can’t say anything about them. All in all, I have to say that Samurai Bloodshow didn’t do it for me. But that’s not to say you definitely won’t enjoy it – the art style is likely to appeal to many people; the music might well float your boat. It brings a few interesting devices to the table that, if polished and beautified slightly more, might work well in future games. If you like card-based or strategy games, there’s a fair chance that you’ll get on well with this one. For the $4.99 price, you’ll hardly be burning a hole in your wallet if you give it a go.